Carry a pre-filled air tank with you that has enough capacity to fill all four tires. This gives you a limited air supply, and doesn't allow you to help out your neighbors who need air. Carry a $15 compressor powered by your lighter jack. This is cheap and gives you unlimited air, but you have to wait forever. I have such a compressor. It's great for bikes and balls, but it only puts about 1 psi per minute into my 225/75R15's. If you have ARB air lockers, you can use the small compressor that powers those to fill your tires. It's a whole lot better than the above option, but it's still pretty slow, noisy, puts out only about 90 psi, and costs $200. Various companies sell tanks of compressed CO2. These tanks last quite a while on a single charge, and are completely portable since they're not tied to the vehicle. The disadvantage is that they do eventually run out, and when that happens, you have to get them refilled at a gas supply shop. Companies like Curry and Ready-Air sell electric compressors that you mount in your engine compartment. These often are setup to fill auxiliary air tanks mounted somewhere on the vehicle. The Quick Air 2 boasts 2.2 cfm at 105 psi and runs about $250. A/C compressors can be converted to pump air instead of freon. These compressors can be gotten cheap ($20-40) from junk yards and are very powerful, since they run off your engine. They not only fill tires quickly, but they can keep up with most air tools. Some people use the OEM A/C compressor for their vehicle. Mounting and belt routing are easy, because the factory brackets are available with the compressor from a junk yard. Most people, however, use the York-style A/C compressors used by AMC, Ford, Volvo, Porsche, IH, and Oldsmobile in the '70's and early '80's. These have an advantage over other compressors in that they have a separate, internal oil reservior, while other compressors are lubricated by the freon in the A/C system. Without freon, they require an inline oiler for lubrication. The Yorks also have a long history of reliable performance and high-capacity output. 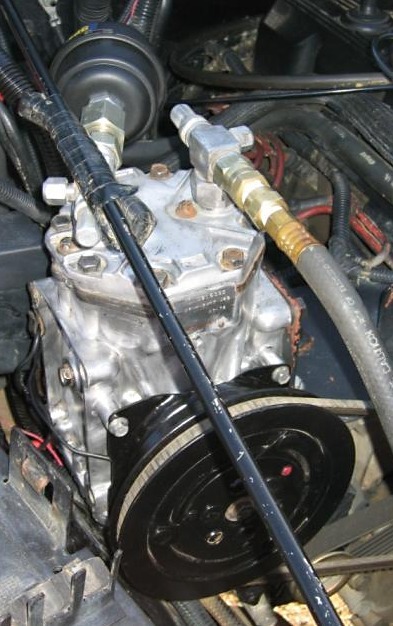 I chose to put a York compressor in my '95 YJ 2.5L, so that's what this page is geared toward. However, much of the info here should carry over to other compressors as well. Because my engine is so different from the 1980 Ford donor engine, using a York turned out to be more hassle than I'd anticipated. If I were doing it again, I might try using the OEM compressor instead. On an older vehicle, the York would be much easier to setup. Now that Brad Kilby has created OnBoardAir.Com (years after I created my setup), all of this would be much easier (albeit expensive). Installing a hand throttle helps boost the engine speed to get an output rate high enough to run air tools. The maximum recommended RPM for a York is 6000, so be sure not to turn on your compressor while red-lining your engine. Also note that this is compressor RPM, not engine RPM. If your compressor pulley is smaller than your crankshaft pulley, the compressor will be spinning faster than your engine. Darin Smith provided a good, generic writeup of on-board air setups. Craig Myers put a York in his '93 YJ 4-cyl using the old Therold mounting setup. Jon Hylands put a York in his '85 CJ-7 4-cyl. Matt Bateman put a York in his '78 CJ-5 6-cyl. Steve Lobel put two Yorks in his '78 CJ-7 with an 360 V-8 -- one to run A/C and one to run air tools. 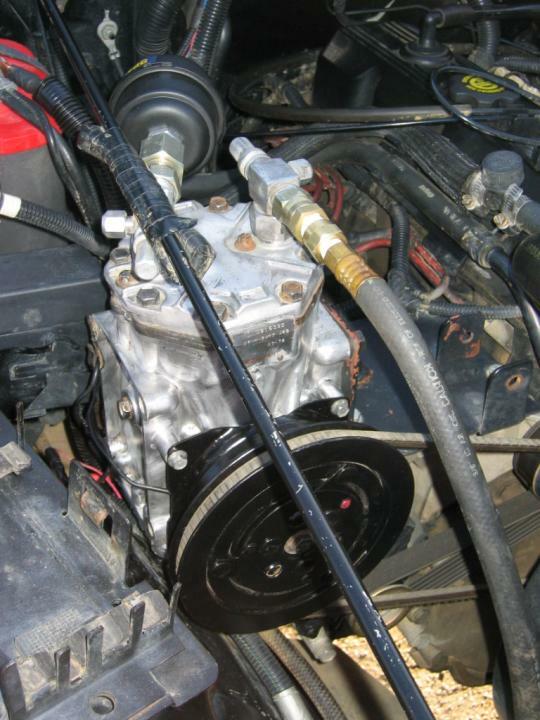 Tom Zehrbach put a Sanden (maker of new Jeep A/C compressors) compressor in his '95 ZJ. OnBoardAir.Com. Although Brad Kilby didn't start this company until well after I'd put together my initial OBA system, it now includes some excellent info and he sells all the parts you need to put together your own on-board air setup. Most of these parts can be found cheaper locally, but the convenience of getting them all in one place is worth something. Dave Gallegos used Kilby's setup to put a York in his TJ. This writeup is very verbose with lots of good photos. Climate Control Inc (CCI) is the manufacturer of York compressors. Here is a collection of comments that other people have made on converting York compressors. Jim Bailey listed reasons and instructions for bypassing the ARB compressor altogether, even when using ARB lockers.